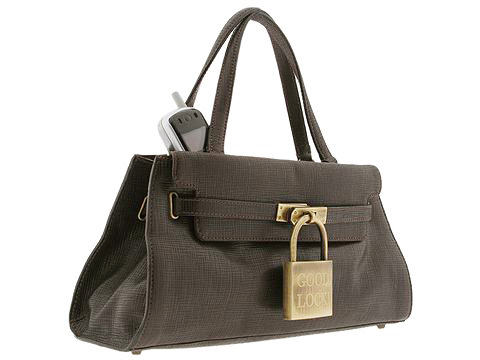 You will look sleek with this classic-looking handbag made of patent Italian leather or textured Italian leather. Holds a wallet, cosmetic case and personal technology. Dimensions: 13 1/2 wide at bottom, 11 wide at top x 3 deep x 6 1/2 high. Dual handles plus a fashionable, removable shoulder chain allowing you to change the look of this bag. Handle drop: 5 length. Shoulder drop: 13 3/4 length. Ultra-chic padlock accent adds stylish whimsy. Platform bottom with feet to protect bag when set down. Top covered magnetic snap closure. Interior lining with a center zip compartment. Cell phone is not included.